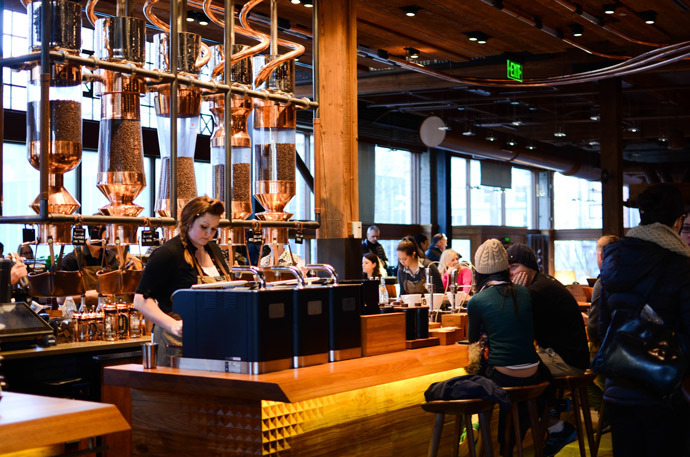 It is no secret that Seattle is the Starbucks (and coffee in general) capital. People here take their coffee very seriously, which can actually be a bit intimidating at times! 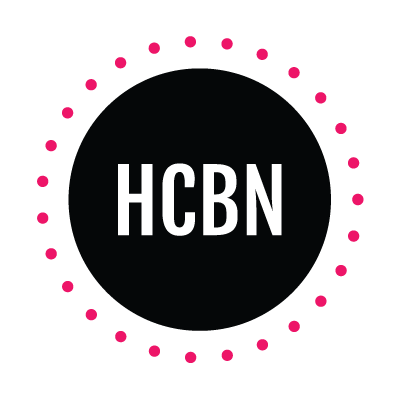 We tried our best to find a few local coffee shops to try out and it was a nice experience. It is also no secret that I love Starbucks. I am not ashamed to admit it! 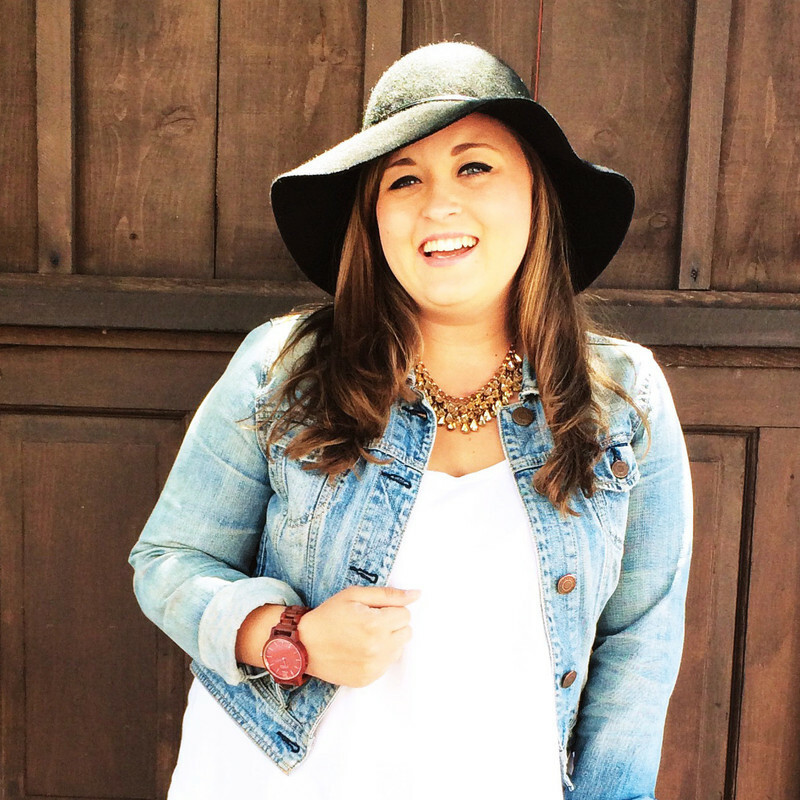 I don't even care if it makes me a "basic white girl" (also, that phrase is so mean...). I just love it! 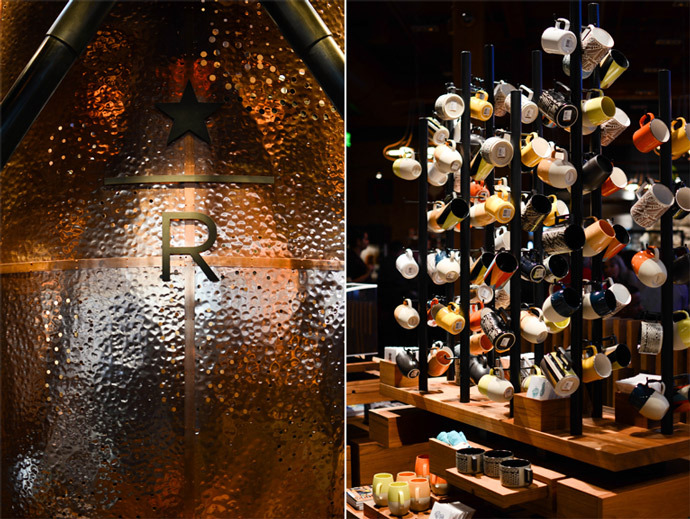 One thing that was high on my list of things to do in Seattle, was to go to the brand new Starbucks Reserve Roastery & Tasting Room. I received a video e-mail about it from Starbucks and decided that since we were going to be in Seattle, we had to go! 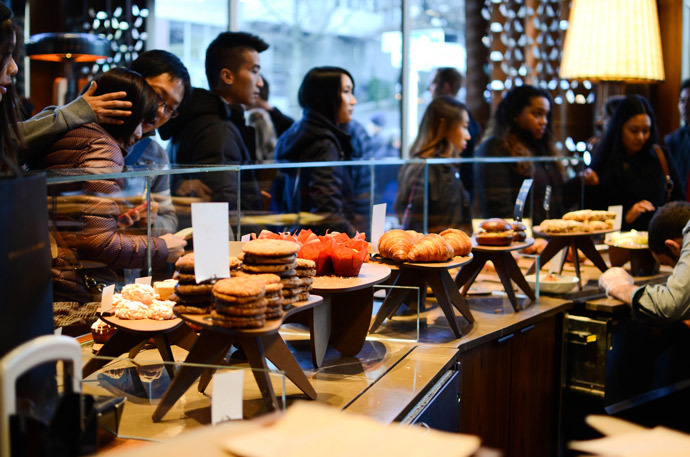 It is just several blocks away from the original Pike Place Starbucks location, but is definitely a completely different experience. 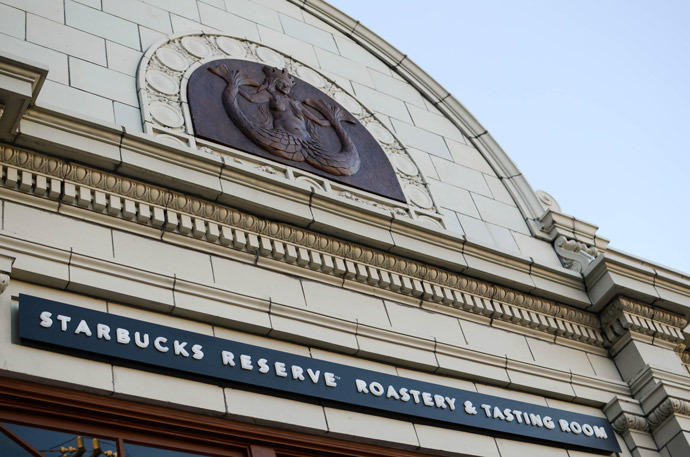 The whole idea behind the Reserve Roastery & Tasting Room is to be a completely unique, one of a kind place where Starbucks can really hone in on more specialty practices and options of what they are most passionate about: coffee. 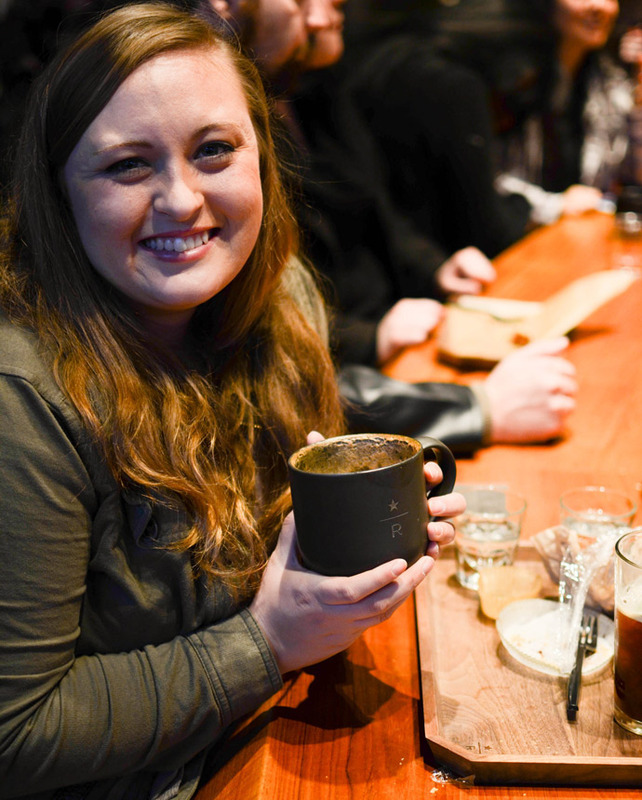 Here, they are able to roast beans that you can't get anywhere else in the world, share a peek into the roasting process with their visitors, hold workshops and tastings, and offer a completely different, more specialized menu than their regular stores. 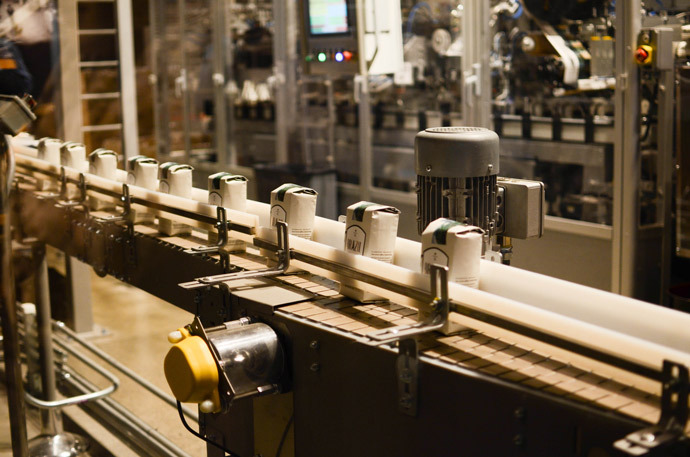 We got to see the beans being poured into their packages, the sealing process, and how the labels are attached. We also got to see the beans being prepped for roasting and how they are roasted. 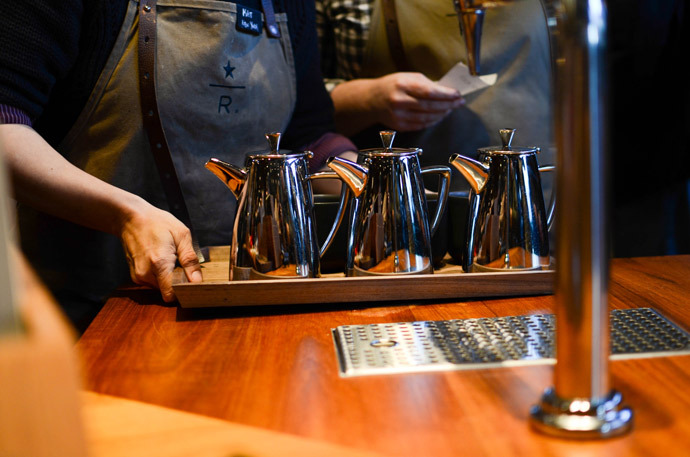 What is especially unique about the Reserve Roastery, is that all of the beans they serve are roasted in house. 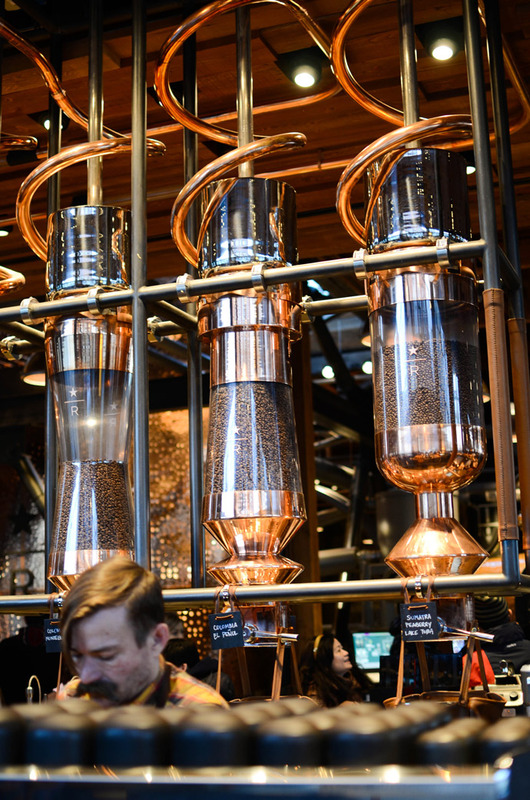 You can see above that they are even funneled to the coffee bar by pipes freshly after being roasted, and then you can choose the beans you want! The menu at this unique shop is also completely different than you would find at a regular Starbucks. I'm pretty sure the poor baristas are asked about 25 thousand times every day if they can order a caramel frapuccino or a white chocolate mocha. 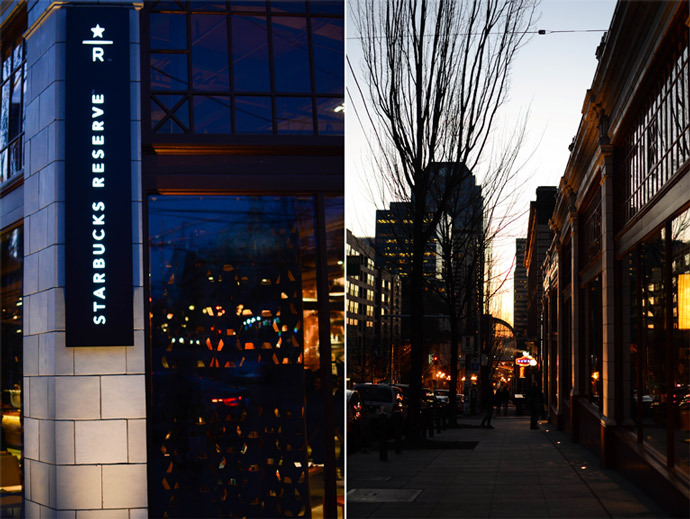 Instead, this Starbucks focuses more on the art of more specialized drinks. 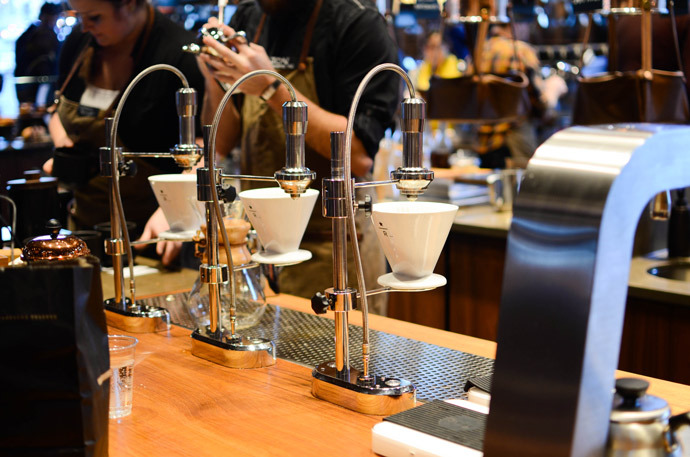 When you order a coffee drink, you get to to pick the specific beans you would like and how you would like your coffee made, like on the Clover machine, dripped, or in a French press. So many choices, but that is what makes this place special! I settled on a classic vanilla latte (can't remember which beans or process!) 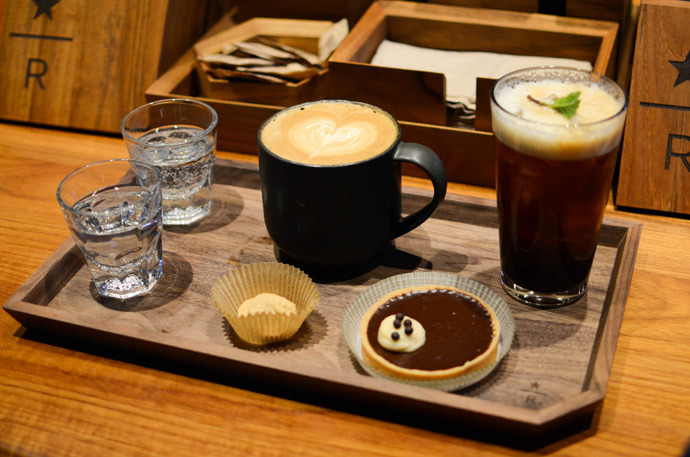 and Dai got an interesting drink that is made with sparkling water, 2 shots of espresso, sweetening syrup, and mint. Needless to say, he hated it. I actually don't blame him... It was a little too different unfortunately. BUT, we tried something new! 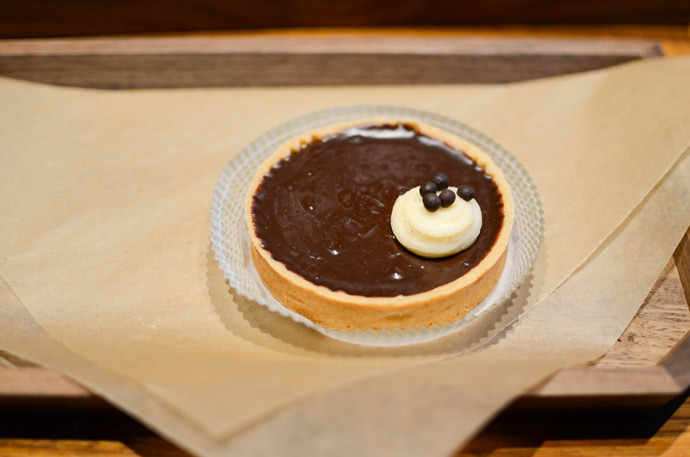 We also shared a delicious chocolate espresso tart, and were given little cookies with our drinks. While the line to order was out the door and down the side of the building, we wandered inside and were actually able to snag seats at the bar! When you are lucky enough to find seats at the bar, a barista gives you a menu and serves you like a waiter, so it was really nice! Definitely beats waiting in a long line to order the exact same things and not have a place to sit. It was a nice place to relax and take in everything that was going on. 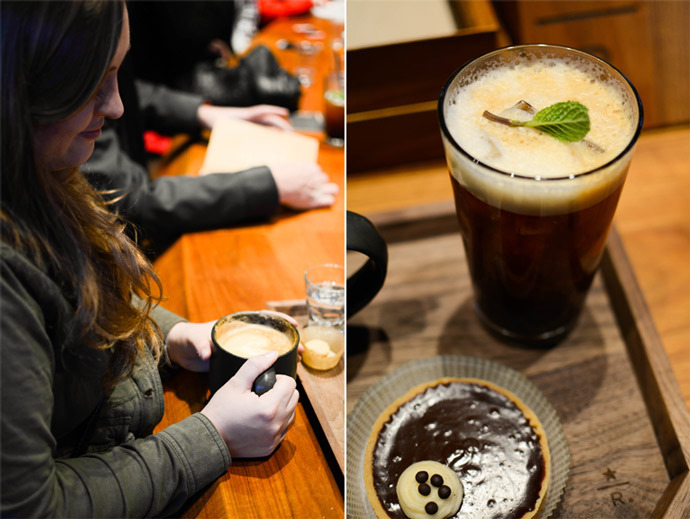 Plus, all of the baristas are much more interesting and 'artsy' than you may find at a regular Starbucks! hahah I love that Dai hated the drink! When I was reading through the ingredients I thought to myself "hmmmmmmm nope!" haha Nice experience overall, it must be fun to see the inside of the whole process. This looks like so much fun! 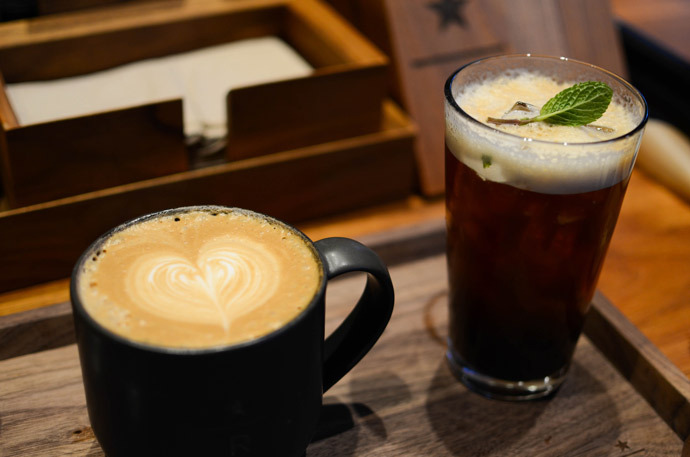 Starbucks is sort of made fun of by baristas at non-chain coffee shops because the drinks aren't exactly traditional or follow the "true" way coffee should be made. But they totally stepped up their game with the roastery! Very cool!! This is super cool! I love going to places like this. That little tart looks yuuuuuuuummmmmyyyyy. Yeah, I didn't think it sounded good either, but I didn't say anything because I wanted him to get whatever he wanted. Later though, after he discovered it was gross, he said he just saw that it was an iced drink and didn't even read the description! Haha so it is his own fault! Yeah it totally was! Haha I really don't know much about coffee so Starbucks is just fine for me ;) Although I am sure they are mocked a bit by other baristas! Oh my goodness that tart was amazing. It was probably my most favorite thing we got! Okay,I actually don't hate you. But I am extremely jealous. I knew this place was coming - and missed its opening by literally - a month. Not going to lie - I'm tearing up a little just thinking about seattle. Man, the west is best. NC is so rough. There are three coffee shops in the entirety of the HUGE town I live in. And ONE starbucks for all of us. ONE!!! ugh. Thanks for at least giving me a glimpse. What did you think of storyville? Did you make it in time for gift cake? Yeah that drink sounds a little iffy. I don't think I could get on board. please tell me he shared that he didn't care for it. Hahahah so true. And then there are people like my father in law, who mock those who have the wrong kind of grinder. NO kidding - he has a $400+ grinder (he won't tell). It ensures that his coffee has "crema". So I got his "crappy" $200+ kitchen aid burr grinder - which also produces crema. Truthfully its incredibly dumb for me to pay for coffee in town because in a lot of ways I have better machines here. (for free!) Thanks father-in-law. p.s. YOU AND I HAVE TO MEET UP. yes. forget the coffee - give me that tart.